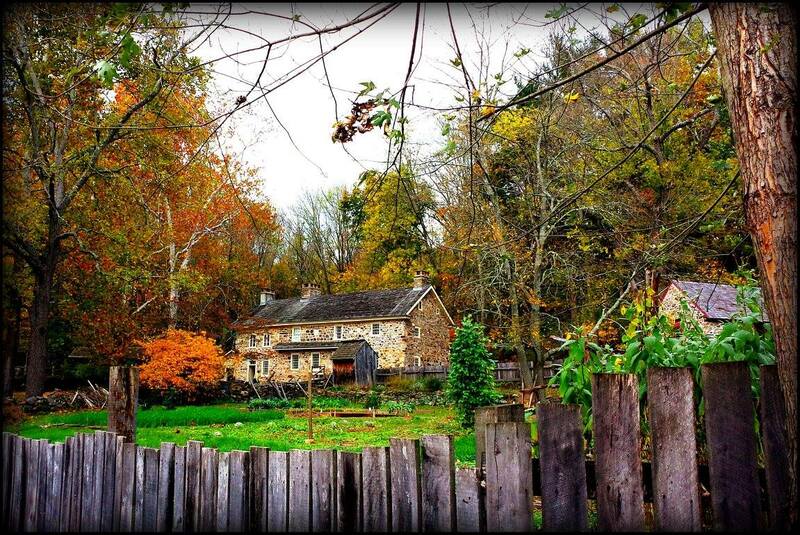 The Colonial Pennsylvania Plantation is a historical museum and working farm located in Ridley Creek State Park in Media (Delaware County), Pennsylvania. 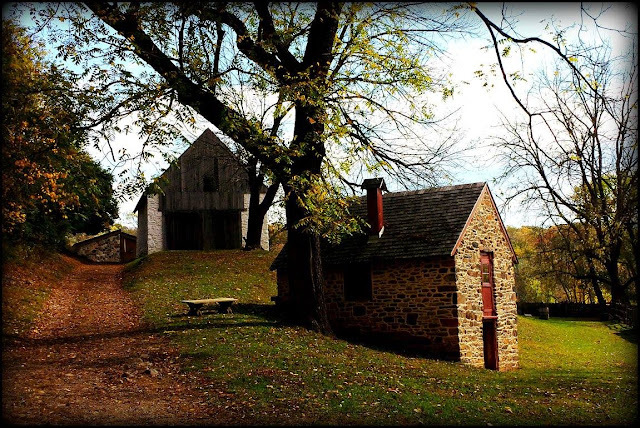 The plantation, which was a working farm continuously for over three hundred years, differs from many colonial historical sites in that it depicts the life of the common man—the “yeoman,” or farmer—instead of that of a well-known figure, during the 1760s to 1790s. 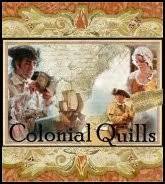 While the plantation’s original owner is not certainly known, the property was purchased by Joseph Pratt, an English Quaker, in 1720. At that point, the original portion of the farmhouse (built either before 1700 or around 1705) was already standing and the land encompassed 110 to 120 acres. Wheat, usually the winter variety, was Pennsylvania’s primary crop at this time, and farmers in the area also grew rye, corn, and flax, among other things. Crops are still grown on the land today, but the plantation’s location within a state park makes this more difficult, as deer and other animals see the fields as their dinner table. Such animals would have been disposed of in colonial times, but now they are protected by being within the park limits. The farmhouse with the kitchen garden in the foreground. Some researchers believe the center section is the original house, while others opine that the eastern end was built first. Additions were then added over the next 130 years. Attached to the left side of the house is the still room, which was used for storage. Unfortunately, I couldn't take pictures inside. The well in front of the house. While it's still in use (note the lever to raise the bucket), the water isn't drinkable. The Pratt family remained on the property until May 1820, when the original owner's great-grandson sold it at auction. 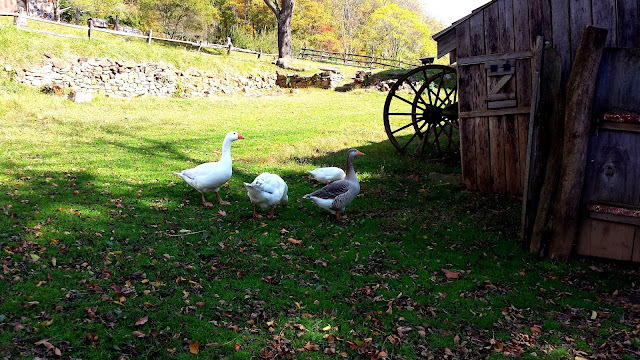 It continued to be a working farm under its new ownership, eventually becoming a tenant farm in the twentieth century. In the 1960s, Pennsylvania bought approximately 2,500 acres to create Ridley Creek State Park, and a local group formed to preserve the old houses within the park. One particular house, part of the Lower Rawle farm, was abandoned but provided the necessities for a farm museum. From 1973 until the present, historians have restored the farmhouse, outbuildings, and land to accurately reflect eighteenth-century farm life. 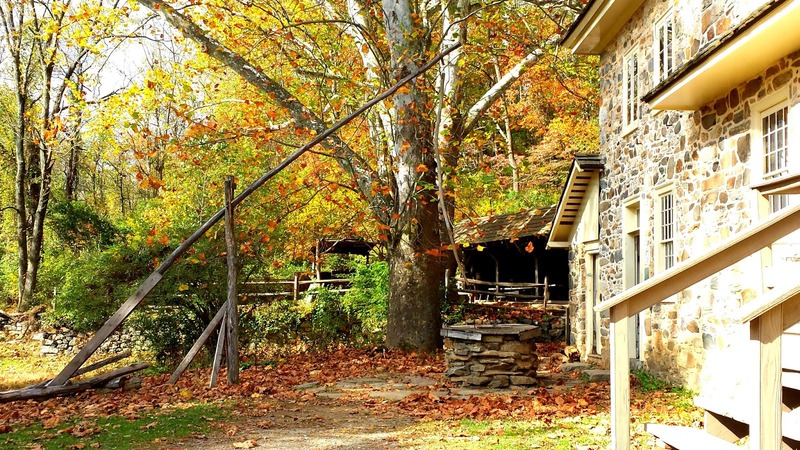 Also on the property are a kitchen garden, spring house, still room, stone cabin, wagon barn, stable barn, sheepfold, pigpen, and chicken house, as well as crop fields, a wet meadow, and an orchard. 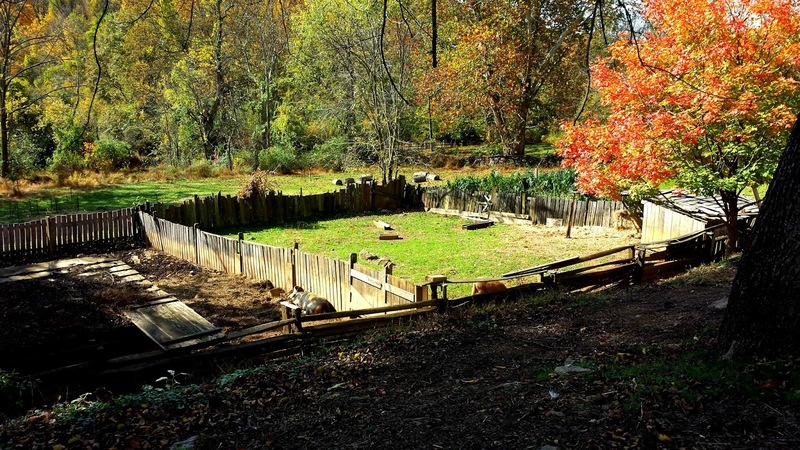 For safety reasons, the animals are kept penned while the farm is open to visitors, but on off hours, most of the animals are released to roam the land freely, as they would have in colonial times. In the foreground is the stone cabin, thought to be built in the late 1600s. The steeply pitched roof implies that the roof was originally thatched. This building is now used for craft demonstrations (potter's wheel on the bottom floor and textile making on the top floor.) In the background is the wagon barn, which now houses, among other things, an interesting array of bones found on the property. The pigpen and sheepfold provide shelter when the animals are not roaming the property. 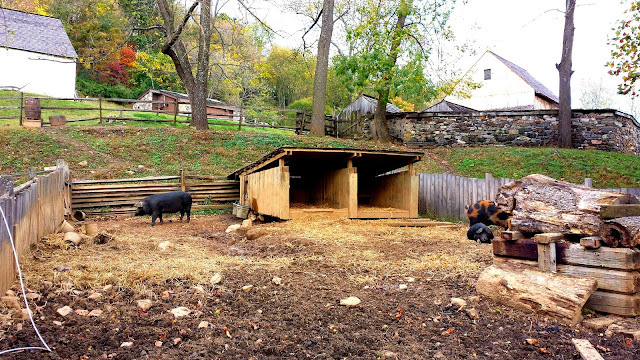 The pigpen and the stable barn (upper right-hand corner). Somehow, I didn't get good pictures of the stable barn (probably because I was carrying my six-year-old at the time, now that I think about it—see next picture for explanation). The stable houses cows, horses, and more sheep, as well as bunnies and chickens in its yard. If you're ever in the area and would like to visit the Colonial Pennsylvania Plantation, it's open on Saturdays and Sunday from April till November. 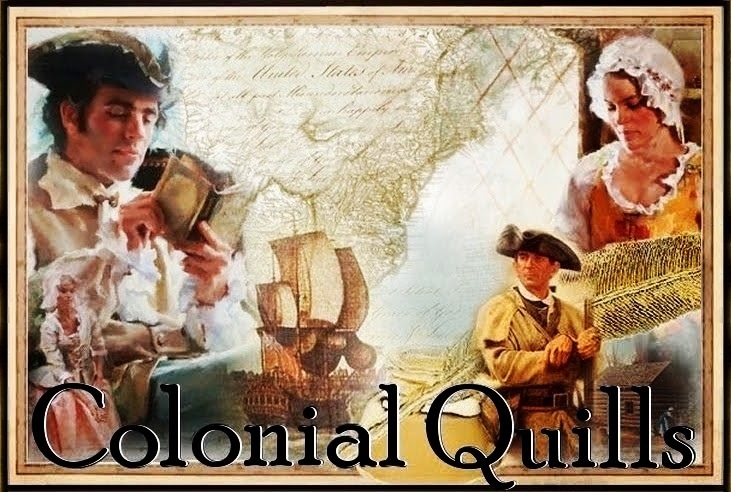 You can find more information at www.colonialplantation.com. These are beautiful photographs, Christy. Thank you for sharing this info. What a great place to visit! You're welcome. It's such a beautiful place. We used to live not far from this and enjoyed visiting it. Thanks for posting this article, Christy! I really enjoyed it. Nice! 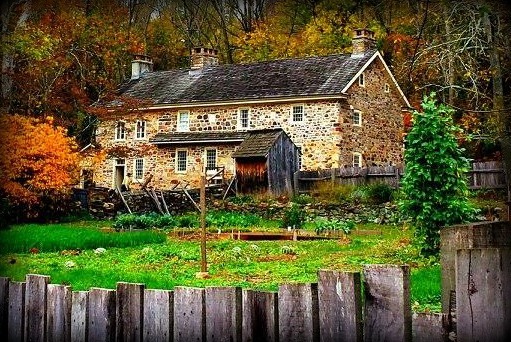 I've lived in southeastern PA all my life and never knew it existed until last fall—when it showed up in my Groupon feed. I want to go back again now that the weather is warmer. Wow, I didn't know about this place but I'm completely enamored! THank you for sharing. Love the photos. Thank you for sharing the info. Great post Christy! Thank you for sharing this wonderful place and these lovely pictures. I looked up the directions and it is only about 2 hours and 50 minutes from us. It would make a nice trip and I think my 12 year old (13 in Aug!..now how did that happen?!) grandson would like all the animals. Thanks, Tina! It would be a great place to visit for an almost-13-year-old. If you look on the website, they have special events some weekends. You're coming from a ways away, so if you go, you might want to talk to the office ahead of time to make sure special tickets aren't needed on the day you go. I would love to visit here, Christy! Thanks for the cool post!! !